**Free airport transportation on the Disney Magical Express for those teams staying on property at Disney and flying into the Orlando airport. The 2019 High School Golf National Invitational will be heading to the beautiful Walt Disney World Resort in Orlando FL. This invite-only tournament field will be made up of 224 boys and 124 girls of the top high school golfers across the country competing at the “Happiest Place on Turf”. Receiving an invitation to the National Invitational is quite an honor since only the best high school golf teams and individuals will receive invites based on their State Championship performance. The Invitational will bring together a wide variety of golfers from nearly all 50 states. Public or private. Small or large. All high school State Championship teams, individual medalists and their families are welcome at the Invitational. This tournament will bring together the strongest ever field in high school golf. 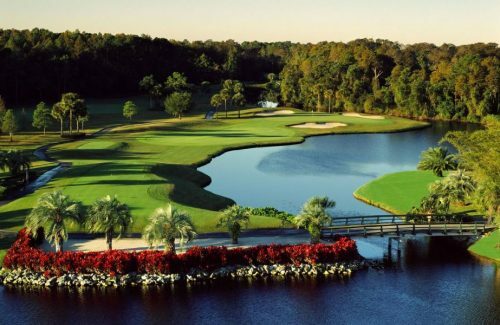 The Boys tournament will take place on the Palm and Magnolia courses, while the Girls tournament will play at Falcon’s Fire Golf Club located adjacent to the Disney Property in Orlando. Both will be 2-day, 36-hole stroke play events including team and individual competition. Many high school sports have championship caliber events that showcase their sport at the highest level on a national scale. The Invitational will do just that for high school golf. The state champions in each division of every state will receive a tournament invitation. In the event the state champions are not able to attend, the 2nd place team will be invited. State Championship teams from all divisions have priority over 2nd place teams. Additional bids will be awarded to the top ranked teams in the NHSGA rankings at the end of the 2018-2019 season based on availability. Teams competing in the Invitational will compete representing their state, NOT their high school. For example, if East Longmeadow High School wins the Massachusetts Division 1 State Championship, they will compete as Massachusetts A at the Invitational versus playing as ELHS Spartans. Since some teams are unable to get sponsorship from their state or their school, this system allows any team to compete without restriction. The State Championship medalists (1st place individuals) will receive an invitation. In the event that the medalist is on the state championship team, the top finishing individual not on the champion team will be invited. State Championship medalists from all divisions have priority over non-medalists. Additional bids may be awarded to the top ranked individuals in the NHSGA rankings at the end of the 2018-2019 season based on availability. Learn about which players will be competing in the 2019 High School Golf National Invitational to date. Please note that the field will be updated after the completion of spring high school state championships. Both the girls and boys tournaments will be 2-day, 36-hole stroke play events including team and individual competition. Teams will be allowed to bring 5 players and we will take the top 4 scores for each day as the “team score”. The National Invitational will be recognized by the Junior Golf Scoreboard (JGS). The Junior Golf Scoreboard typically receives results for over 2,100 tournaments worldwide and ranks approximately 10,000 - 11,000 players at any one time. The JGS is the foremost used junior golf ranking system by varsity college golf coaches since 1998. AJGA PBE points will be awarded to the Medalist (4 stars) and to the top 10% of the field (1 star) for both the girls and boys event. The cost to compete in the 2019 National Invitational is $200 per player. This includes a dinner Wednesday evening, two championship rounds, lunch during both tournament rounds along with tee gifts and awards. All taxes, resort fees, and gratuities are also included in this tournament fee. The $200 per player tournament fee does not include lodging or practice round costs. A discounted room block at the All Star Resort at Disney World Resort is available for players, families, and spectators on a first come first serve basis. There are a limited number of discounted rooms available, so be sure to book early with our staff. Please fill out the form to receive information on qualification procedures and/or to stay up to date on event details. Thank you! Both the Magnolia & Palm courses played host to the Walt Disney World Classic, a regular stop on the PGA Tour with winners the likes of Luke Donald, David Love III, Vijay Singh and Tiger Woods. Disney’s Magnolia and Palm Courses have both received 4 stars from Golf Digest. Named for its majestic magnolia trees, the Magnolia course features elevated tees, spacious greens and challenging water hazards. Wide fairways invite you to hit the ball and hit it long, but beware—11 of the 18 holes boast water hazards and 97 bunkers dot the landscape. The Palm course features shimmering lakes, tropical sands, palm trees and sloping greens, includes 9 holes with water hazards and 59 bunkers—providing plenty of challenges. 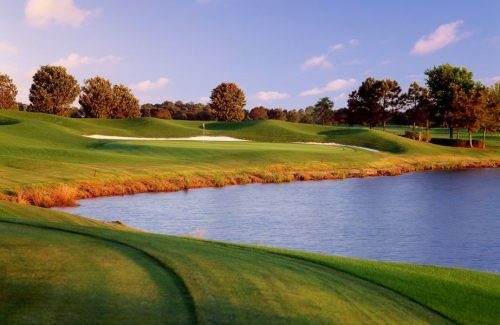 Falcon’s Fire Golf Club is a Rees Jones designed championship course and is recognized as one of America’s Top 15 Women Friendly Courses by Golf for Women. A former host to the Senior PGA Tour Regional finals, Falcon’s Fire will offer a challenging yet playable layout for the best high school girls golfers in the country. Tournament participants are able to play practice rounds the week of the event at a discounted rate. Parents, coaches and spectators are permitted to book practice rounds at the adult discounted rate when playing with a tournament participant. A Tuesday 12:30pm shotgun is available on the Palm Course along with a Wednesday 12:30pm shotgun on the Magnolia course and an additional 1:30pm shotgun on the Palm Course for the boys Invitational. Parents, coaches and family members are able to join players for these rounds. These shotgun rounds will be booked directly with the NHSGA. The rate will be $32 per player. All other practice rounds are available on a first-come, first serve basis and subject to availability. Boys discounted practice round rates are only available during the three shotgun rounds. Girls discounted practice rounds will be booked through the Falcon’s Fire golf shop. Practice round payments may be made during registration or at a later date but it is strongly suggested to book practice rounds as soon as possible. Please note that registration will be taking place at the Disney Magnolia driving range. There will be an alternate check-in at the All-Star Resort for players and coaches who are not able to make it to the course. Registration is strongly encouraged and if you are not able to register on Wednesday, please let us know in advance. Who can I contact for questions on qualifying status or Invitational details? All questions can be directed to Chris Noble, NHSGA Manager, via phone or email. See the Qualifying & Tournament Scoring section above. Who is eligible to compete on an invited team? Any high school golfer from the invited school is eligible to compete in the Invitational. Players do not have to play in the State Championship to be eligible. Graduated seniors from the qualified team are permitted to play as long as they have not started college courses. What if our high school OR high school state athletic association says we cannot play? Some High School Athletic Associations are very restrictive on what high school golf teams can and cannot do. Since you will be representing your state at the “club level” and the event is taking place “out of season” most teams should be able to participate in the Invitational without restriction from their state high school athletic association. As long as you are not “representing your school” and using school funds for the invitational tournament, you should NOT be restricted to compete by your high school. If your high school is funding your trip or you are representing the school by wearing school uniforms, you may be subject to high school and state regulations. The NHSGA is focused on ensuring future high school eligibility for golfers remains intact. It is highly recommended that you check with your high school athletic association that no rules or regulations are broken that would affect your eligibility moving forward. The NHSGA is not responsible for sanctions placed on any team or player who breaks a school or state athletic association rule. Why does our team represent our state, not our school? The NHSGA wants to ensure every participant in the High School Golf Invitational remains eligible to participate during their regular high school golf season. Some High School Athletic Associations are very restrictive on what high school golf teams can and cannot do. Since you will be representing your state at the “club level” and the event is taking place “out of season” most teams should be able to participate in the Invitational without restriction from their state high school athletic association. How do I register and pay the $200 registration fee? Once an invited team RSVPs, a link will be sent to complete payment for registration. Schools, parents, or players are able to pay for the player entry fee. Contact info@highschoolgolf.org for questions about registering with purchase orders or checks. Who is able to pay the $200 registration fee? Schools, parents, or players are able to pay for the player entry fee. A link will be sent to invited teams/players once they RSVP for the Invitational. How much do practice rounds cost? The NHSGA will be hosting a practice round on Wednesday, June 26th on the Disney Magnolia Course which will be open to any boy participants and their families. The cost will be $32 per player, junior or adult. What happens if our coach cannot attend, but our team wants to go? Having your high school coach at the Invitational is encouraged, but not mandatory. If you are attending the tournament without a coach, you will need to have a designated representative who is responsible for the team or individual player. Are coaches allowed to coach during the Invitational? The National Invitational will allow coaches (no spectators or other players) to communicate with players during play except in hazards or on putting greens. Only 1 coach allowed per team. Coaches for the event must complete verification & approval from the NHSGA to provide advice during the Invitational. All other people are considered outside agencies and are not permitted to speak with players during the round regardless of the player(s). Can a parent act as a coach for the Invitational? In the event that a high school golf coach cannot attend the National Invitational, we will allow a parent or guardian to act as a coach for the duration of the Invitational. Can our team still compete if the Invitational falls in our state's dead period? Yes, teams and individuals are still able to compete even if your state has a dead period. Your high school coach cannot be in attendance for the event, unless the coach has a son or daughter on the team. What happens if only some of our players can attend the Invitational? If you are unable to field a team of 5 for the tournament, the players who are able to attend can play as “individuals” representing your state, but you will be unable to have a “team score” due to lack of participation. If I already graduated from high school, can I still compete? Yes, if you are a high school student who is a senior and you have not yet started college, you are welcome and able to compete in the tournament. Will college coaches be present at the event? Yes, the Golf Coaches Association of America is a part of the event. College golf coaches nationally are invited and will come and watch the top teams and players compete. How many AJGA PBE performance stars will be awarded? The AJGA will award 4 PBE stars to each Medalist. 1 Performance Star will be awarded to the top 10% of the field for both the Boys and Girls Invitational. Will the National Invitational be recognized on Junior Golf Scoreboard? Yes, the National Invitational will be recognized on the Junior Golf Scoreboard (JGS). The JGS is the foremost junior golf ranking system used by varsity college golf coaches since 1998. The payment deadline is determined based on the teams/player’s qualifying date. This date will be issued along with the payment link once the invited team/player RSVPs. Extensions for payment must be approved by Chris Noble (chris@highschoolgolf.org). What hotel am I staying at and what are the room accommodations? Competitors, coaches and families will be staying at the Disney All Star Resort. The room accommodations will include two double sized beds in each room. How do I book hotels at the Disney All Star Resort? Reservations at the Disney All Star Resort may be booked on a first come first served basis. Requests for lodging may be made during the RSVP process or at any point leading up to the Invitational in June 2019. It is recommended to reserve lodging as soon as travel plans are finalized. Can I get discounted lodging before or after the tournament dates? Yes. You are more than welcome to turn the National Invitational into a family vacation. You can come and go as you please. The discounted room rates at the Disney All Star Resort will be available up to 3 days before and 3 days after the Invitational. Can I make changes/cancellation to my room reservation? Yes. You are able to make changes to your room reservation at the Disney All-Star Resort by June 1st, 2019. After this date, no changes can be made to your reservation. Can I bring my family and friends to watch the Invitational? Yes. We welcome and encourage family members and friends to attend the tournament. Spectator carts will be available for rent for the cost of $25 per cart for those needing assistance getting around the course (first come first served). We ask that all spectators remain 30+ feet from Invitational participants at all time. Are there discounts on park tickets? Yes. The NHSGA is able to introduce you to the Disney World Resort staff to receive information on discounted park tickets during your stay. Details on discounts for Disney park tickets will become available in early 2019. I play on a co-ed team - will I still be able to compete? Yes, if you play on a co-ed team, you are welcome to compete in either Invitational. Both Invitationals are gender neutral events. All players in each Invitational will play the same set of tees. If the tournament is shortened due to weather, will a Invitational champion still be crowned? If 18 holes of the tournament are completed, an Invitational Champion and 1st and 2nd All-Tournament team members will be recognized in the girls Invitational. The Boys Invitational will recognized co-champions since the field will be split among two courses. Do we have to stay on Disney property for hotel and lodging? A limited number of discounted rooms have been blocked at the Disney All Star Resort. If staying on Disney property, there is free shuttle service available to and from the airport and across all Disney Resort properties. We encourage players to stay on Disney property to help with logistics, but it is not mandatory for you to stay on-site. What transportation will be available during tournament week? The Disney Magical Express will transport any players, coaches and parents to and from the hotel on the Disney property to the airport and parks. This transportation is only available for players, coaches and their families who are staying on Disney property. Are there spectator carts available during tournament rounds? Yes, spectator carts will be available for $25 per cart/day for those who wish to rent one. Can a team substitute a player after completion of round 1? Yes, teams are able to substitute players at the completion of a round, but not during the course of a round. Will I receive a refund if the tournament is rained out? Yes. In the event that the golf course is deemed unplayable due to unsafe or unplayable conditions, a player/team will receive a refund for the tournament greens fee. In the event of inclement weather, if the course staff deems the golf course unplayable, the NHSGA will work with the host course to provide partial or full refunds depending on the nature of the situation. Refunds will be issued to players/teams on a case-by-case basis. Refunds will only be issued after May 3rd if a replacement team fills the spot. Will the National Invitational have live scoring? Yes, the National Invitational will have live scoring and allow friends and family back home to follow along in real time with tournament play. What yardages will we be playing from? Am I responsible for maintaining my amateur status and eligibility in high school? Yes, you are responsible for maintaining amateur status and high school eligibility. What is the gender identity participation policy in the National Invitational? The National High School Golf Association believes that athletic participation is valuable to students’ physical, intellectual, social, and character development and accordingly, we value inclusion. Guided by this value, our policy permits transgender students’ participation in the National Invitational in a manner consistent with their gender identity, irrespective of the gender listed on a student’s records and without prior medical or mental health care. What are the Liability Release and Tournament Participation Terms? The Liability Release and Tournament Participation Terms can be found here. Any questions contact info@highschoolgolf.org.